In every biography of the Bible in which we are given much detail, we find that this fundamental law of life had to be learned, and usually slowly and painfully. The discovery of the independent self … continue reading. "The Lord is my shepherd, I lack nothing. He makes me lie down in green pastures, he leads me beside quiet waters, he refreshes my soul. He guides me along the right paths … continue reading. Easter Perspective: Why Did Jesus Have to Die? When I was younger, I associated the Easter bunny and coloring eggs with Easter. Although I grew up in a Christian home, the true meaning of Easter was not my family's focus. It was not until I was … continue reading. March 16, 1982Dear Rose,How glad I am to get your letter. It is good to now hear how evidently the Lord is walking in you in some stormy waters, rather than you hopelessly sinking in them. I'm so glad … continue reading. The Spirit's Drive in UsSo it is now with us as with Him. Freed from our own self-problems, a permanent drive "eats us up," that all the world, and that means for us all within our guided … continue reading. (To see accompanying images please see PDF version of this article) Originally printed in ZNews, the youth magazine published by Zerubbabel Press, we feel this will benefit readers of all … continue reading. 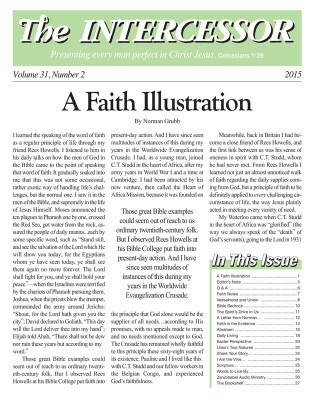 Well, the time has come again for me to write this issue's editor's note for The Intercessor. I need to get going on it because the publication date is fast approaching. All of the articles are read, … continue reading. I want to tell you about a book that has meant a lot to me. It is called The Tryst, by Grace Livingston Hill, and was first published in 1921 . A friend had found and read it on her Kindle, and … continue reading. If I am as He is, how does it work out in practical life? It means a revolution in my outlook. Normally, I interpret all happenings of life in terms of their effect on myself. My physical condition, … continue reading. 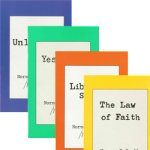 A Faith IllustrationBy Norman GrubbI learned the speaking of the word of faith as a regular principle of lifethrough my friend Rees Howells. I listened to him in his daily talks on howthe men of God … continue reading.